You can blame Ludo. 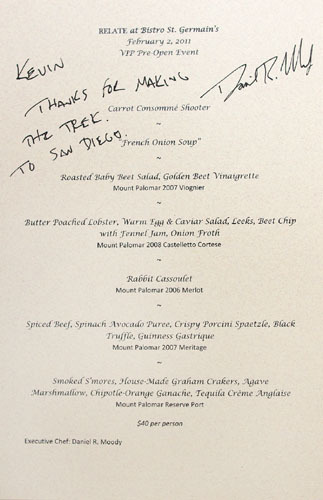 After all, it was he who engendered our current fascination with the pop-up restaurant. It was almost inevitable, really, that the trend of the ephemeral eatery would move down south toward San Diego. The brainchild of former LudoBites Sous Chef Dan Moody, Relate, housed inside breakfast spot St. Germain's Cafe, is the county's first pop-up, and will run Tuesdays through Saturdays, February 3rd through the 26th. I, along with several other bloggers, were invited down to a preview dinner prior to the grand opening. About the Chef: The 30-year-old Chef is a native Southern Californian, raised in the tony enclave of San Marino. Moody's fascination with cooking and eating began at a young age, and after graduating from Torrey Pines High School (his family moved to Del Mar Heights before his senior year), the Chef enrolled at the Culinary Institute of America at Hyde Park. During his time at the CIA, Moody externed for Ludo at Los Angeles' famed bastion of French cookery, L'Orangerie. 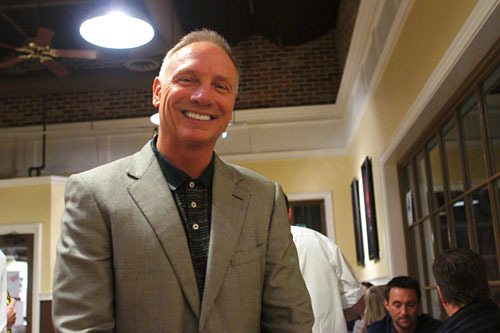 After completing his degree in 2000, he stayed on as a line cook for 18 months, dabbled in catering, cooked briefly at Rancho Valencia and Fairbanks Ranch Country Club in Rancho Santa Fe, and worked a stint at Christopher Gross' eponymous Restaurant out in Scottsdale, Arizona. Wanting a change of pace, Moody decided to attend Arizona State University; he earned a degree in economics, and subsequently worked in financial services for four years. The kitchen beckoned, of course, and Moody was once again drawn toward his first love. 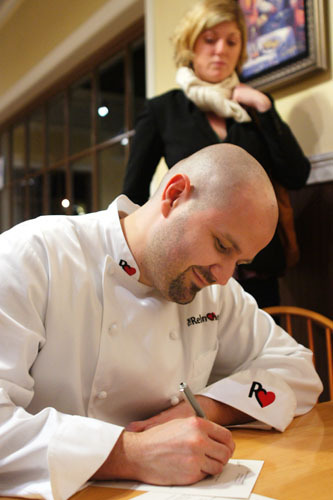 He established the RelationChef brand, then got back in contact with Ludo, who had left L'Orangerie in 2002. Moody was able to secure a stage at LudoBites 3.0, then served as Sous Chef for the following three iterations. 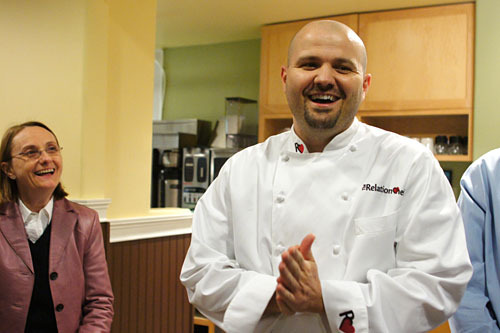 In September 2010, Moody struck out on his own, cooking his own suite of dishes during a well-received night at Test Kitchen. Since that time, the Chef has been busy preparing for Relate, his first solo venture set in the up-and-coming town of Encinitas. Moody selected St. Germain's Cafe because the owner, Roy Salameh, is in the process of transforming the restaurant in to a more ambitious Bistro St. Germain's. It's a win-win for both parties. The room was filled with friends, family, and media, including Elliott of F for Food and Holly of Seeking Delicious, as well as locals Bobby and Stephanie of Gourmands Review and the new food forum The Communal Table. A quick pre-dinner chat with the Chef. Note that the lady in the photo is none other than Moody's mother! Dad was there as well, taking plenty of pictures. Moody describes his food at Relate as contemporary French-influenced, with some classic American and Asian flair thrown in for good measure. The restaurant offers up a daily prix fixe menu of around five courses, normally priced at a reasonable $55, plus $15 for wine pairings from Temecula's Mount Palomar Winery. Click for a larger version. 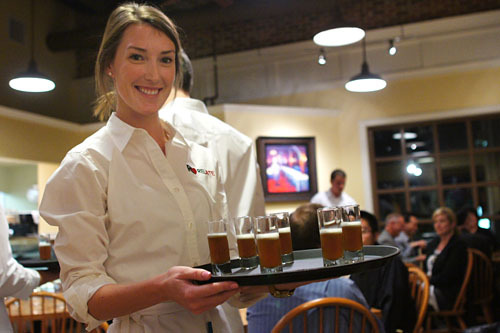 For this course, Moody began with carrot juice, which he then put through the whole consommé-making process, replete with the use of egg white and mirepoix (an onion, carrot, celery blend). 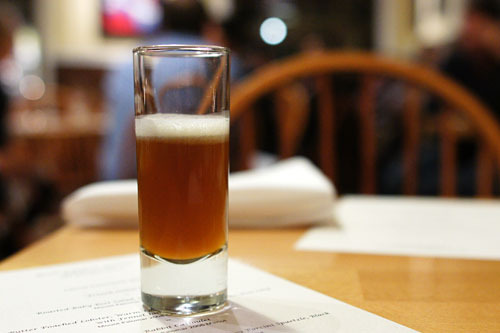 This resultant commixture was filtered and clarified, then topped with a ginger-infused milk foam. Shooting down the consommé, I noted an intensely ginger-y nose leading to a good interplay of carrot and milk on the palate, all finishing with a slight hint of the mirepoix. A quick jolt to awaken the palate. 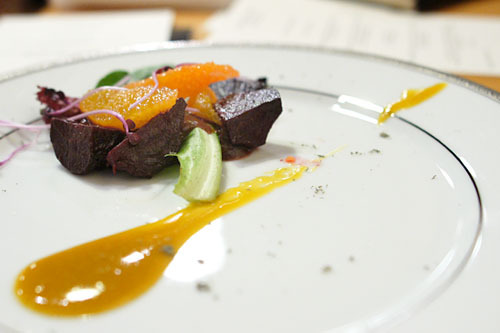 Here, roasted beets were paired with lettuce, cinnamon and Dijon-beet vinaigrettes, cara cara oranges, purple radish, and a cherry-yam-lavender purée. I have quite the disdain for beets, but they were certainly serviceable here, nicely textured and imbued with a spicy sweetness. The key for me was the use of radish and lettuce, as both components helped to temper the distinct sugariness of the root vegetable. Lobster arrived showing off pleasant snappiness and its inherent sweet brine. 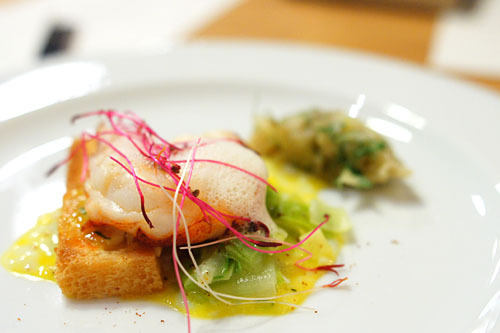 I really appreciated how the crustacean worked with the lusciousness of the egg yolk and the tangy leeks. Meanwhile, the Melba toast served to ground the dish, and the magenta microgreens adding a great tinge of pepperiness to the fray. My only issue was with the fennel jam, which I found rather sugary. The cassoulet managed to be my favorite course of the night. Paying homage to the Chinese new year, Moody used plenty of rabbit here, as well as duck confit and sausage, all topped with bull's blood beet fronds. Think rich, hearty, mouth-watering flavors, accented by just a hint of piquancy from the greenery; this is how cassoulet should taste. I could've eaten a much larger bowl, and Elliott even commented: "it kinds of hugs you!" Our final savory course brought us Moody's signature dish. The meat came spiced with chipotle, ancho, coffee, ginger, cinnamon, and clove, and as a result, demonstrated a lovely beefiness accented by a great bit of creeping, lingering spice. 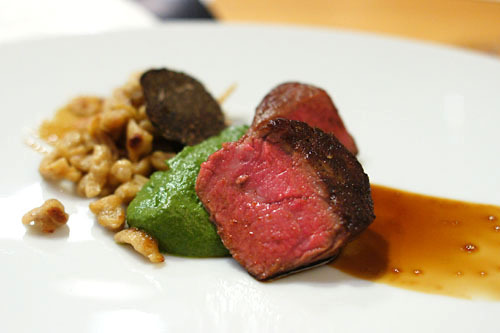 As the same time, the avocado did an admirable job in balancing the weight of the beef, and the spaetzle added body and substance to the plate. I didn't feel that the truffle was absolutely necessary, however (though I certainly didn't mind it!). Quite nice. 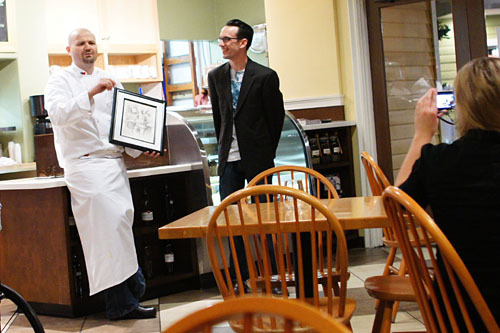 Before dessert was served, James Thorn of Exclusive Collections art gallery introduced local artist Christopher M, whose artwork is currently displayed at Relate. 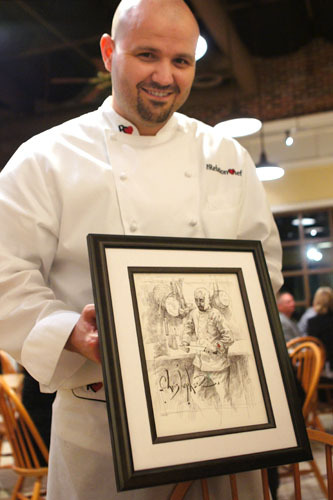 Known as "The Painter of Chefs," Christopher then proceeded to present Moody with a portrait of the Chef examining his knives. 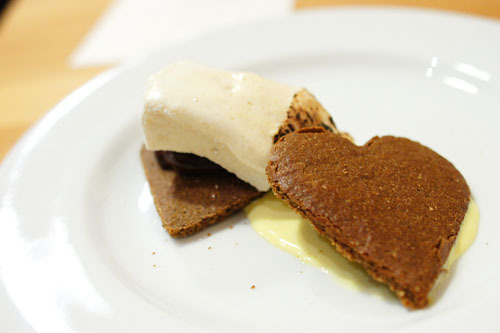 I fully expected Moody to serve his signature cheesecake for dessert, but instead, he opted for some s'mores, a version of which he'd presented previously at LudoBites. The s'more remained faithful to the idea of the original, displaying a deft interplay of marshmallow, chocolate, and graham cracker. However, the dessert also had a nice citrus tinge to it, as well as a distinct flavor from the use of agave. I also appreciated the smokiness imparted to the dish (meant to recall a campfire), courtesy of The Smoking Gun. At the end of the meal, Moody came by to say thanks, sign some menus, and show off his mug, immortalized. All in all, a promising preview of San Diego's first pop-up eatery. Moody sent out a solid suite of dishes that managed to hit the spot nicely. Certainly, the cooking here isn't as adventurous as what he was putting out at LudoBites, but then again, I'm not sure if that would fly down here. Given the culinary conservatism prevalent in these parts, this is probably the right mix of contemporary and classic. It'll be interesting to see how Moody's cuisine develops over the course of the run. Wow you got the review up even after that drive, impressive.. 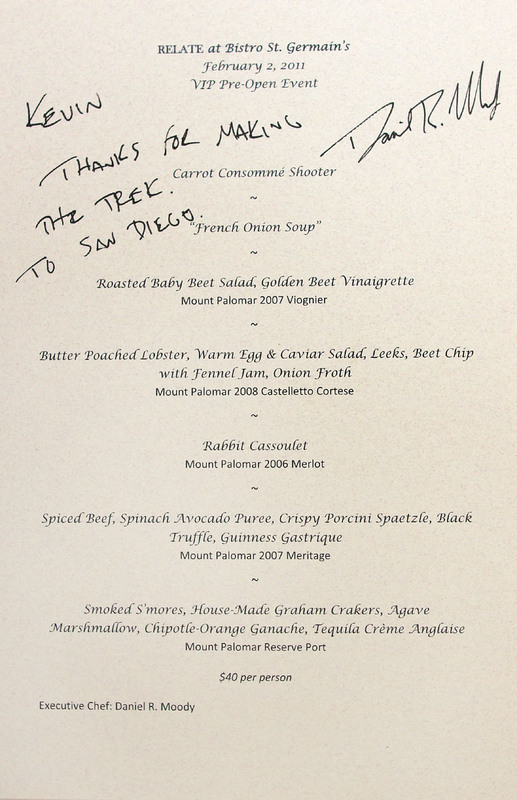 Chef Moody put together a solid menu and I think it will work well in SD.. I just hope he pushes it a little more over the course of the run.. I wanted that french onion soup amuse!! Always good to see you, wish we got the chance to chat a little more.. Thanks for linking the Communal Table it's coming along well so far.. It was also very nice meeting Holly and Elloitt.. I'm not at all surprised you were the first to blog, it's now your legend. Though I do wonder if you sleep. Thanks for the post, it looks like it was a lot of fun, and I can't wait for my turn! Much love to Chef Dan! Yay! More dining in San Diego! Thanks Kevin for making the culinary trek! going to vegas this wkend for my friend's bday. any recommendations for brunch spots? thanks! I'm sad I couldn't make it - looks like a successful start to the restaurant. Love the Chinese New Year inspiration too! What was your opinion of the wines? I've visited Mount Palomar and thought it was a very fun place to hang out (especially the time I was there for their Oktoberfest) but did not enjoy the wines at all. I found the whites paired a lot better than the reds but over all nothing special.. I think his food will go a lot better with beer and I'm curious how it goes tonight with taphunter pairing the courses..
Bobby: Actually, it wasn't that bad to get out--only five courses after all. ;) I agree that it would be nice perhaps to see the menu get edgier as the run progresses. Kristen: Well timliness if one of my hallmarks I suppose. I do sleep, but definitely not as much as I'd like to! Mike: You making it out to Relate any time? Daniel: That's dedication for you! For Vegas, I actually don't eat brunch, so no first-hand experience there; Bouchon and Hash House A Go Go come to mind though. Good catch on the typo BTW. Darin: Yeah we could've used another Angeleno in there--it was just the three of us. Justin/Bobby: I wasn't a huge fan of the whites, and actually found the reds much more to my liking (which is sort of the opposite of what Bobby thought). I'm thinking beer might be an overall better choice as well. I cannot say that I am. I don't personally see the pull. I am getting the feeling of lukewarmness of this restaurant. I have been wrong before. My next three on the list are: Stone World Bistro and Gardens. The French Laundry. Redd Napa Valley. @Kevin Five courses was a little disappointing.. I was hoping for at least 7.. Stephanie and I made a trip to In n Out after we left..
Mike: Fair enough! If you're going to The Bazaar, you might as well check out Saam instead. Bobby: Ha! Interestingly enough, I made a comment to Elliott and Holly that I could've eaten a Double-Double afterward. I enjoy the service of Saam. The experience. But, I am not a fan of no supplemental coverage there. No freedom of choice. This is the menu. The End. The only real choice was a supplemental course of risotto with black truffle. The only way you would get another dish out of the menu is if you had an allergen or didn't like the product in a particular dish. If The Bazaar had the service of Saam, then that would be a perfect dining experience for me personally. I visited last night and had the aforementioned french onion amuse. It basically looks like a small bite-sized chicken nugget, but it was executed extremely well. In addition to the soup in the middle, there seemed to also be a hint of sweetness in it (couldn't identify that exactly). As to the menu, I guess it is a little edgier now since there's a chicken liver mousse and he has a foie terrine and escargots a la carte. Our table got an order of the a la carte items to share and nobody left hungry. Looking at your photos again, it does seem like the portion sized increased a little. PS - Our waitress was the one you have in the photo with the carrot consomme you really made her day/week/month by including her in the blog post. I think you have a fan forever. Mike: Ah I understand. I wasn't aware that there was even a supplement option--must be a fairly new thing. I do appreciate that you can get items in Saam that aren't available in the outside dining room. 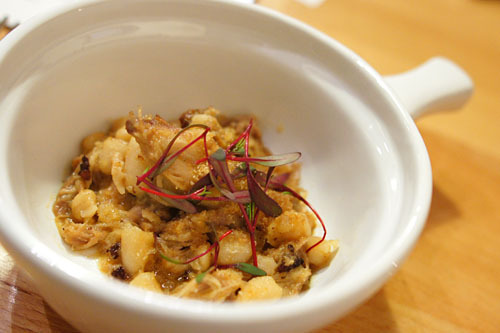 James: Thanks for the update about the soup--it actually reminds me of a "Fried Liquid Foie Gras" that Ludo once did. In any case, it's good to see that Moody's stretching more now. Looking at your menu, it's clear that he's already becoming more adventurous. Loved the anecdote about our waitress as well! I think the black truffle risotto is a seasonal supplement. I do also appreciate that you can get dishes in Saam that you can no longer get in The Bazaar. it adds a sort of elitism to the restaurant.